As I neared the end of my sabbatical I pondered whether I’d be able to return to a nine to five. Nobody enjoys returning to work after a week’s holiday, imagine if you’d been away for two years. When you travel the pace of life changes – things slow down. You learn to take your time, after all you have plenty of it. I didn’t savour giving up this freedom. Coaching was a way to retain that flexibility and continue doing something I loved. After four days glued to my computer I’m finally taking a moment to breathe (by writing this, at my computer). Eating, sleeping and occasionally coaching club sessions were the only times I stepped away from my desk; not quite the flexibility I planned. It isn’t another example of poor time management, but November was a packed month with racing in Vegas, BTF courses and their course work and athletes needing plenty of attention. I thought the off season was supposed to be laid back? Not that I’m complaining, it’s hard to complain when your first two paragraphs refer to a two year sabbatical and a week in Vegas. 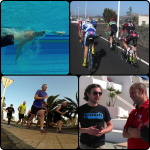 A few days entirely focussed on my athletes’ plans was an opportunity to reflect on how things have changed. Besides the busyness, updated processes and improvements to efficiency, the details of my plans have subtly altered over eighteen months. 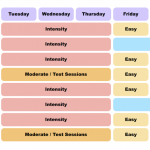 Principles remain the same, my approach is still built around a set of key workouts over weeks and months, but I am better at balancing workload and rest within a week. Challenging athletes – over-trained or under performing – forced me to experiment, to adapt ideas and produce schedules that pulled them out of downward spirals. 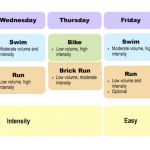 Triathlon media seems to be placing greater emphasis on recovery lately. Recovery is important, but then so is training, you don’t get fitter without doing the work. The difficulty isn’t giving an athlete less, it’s giving them just enough. Often that comes down to finding the right timing. My original simple Ironman training weeks worked, those templates got me through my first races, but there is always room for refinements. A year of balancing schedules for a wide variety of athletes and my plans have a different rhythm with stronger distinction between easy and hard. For the majority of my athletes it seems to be working well.